So you're doing the "things" (brain is failing me here), too now? :) Cool. Except that does NOT look like an easy task before you. Or sayyy a teenager in your household. And yes, I accidentally typed hosehold the first time. Oh man! I'm cursing those damn kids under my breath right now. That hose cannot be saved. Run over it with your lawnmower several times, rake up the pieces, bury them in a corner of the yard, then get to the store for a new hose. Works every time! At least that would be my excuse when I hacked it to pieces rather than try to untangle it. Turn the water on full and THEN take a picture! I'd so stick a sign on that thing "FREE" and then go buy a new one. That looks like the one in my back yard. The one in the front (where everyone can see it) is in one of those neat little boxes and it rolls up every evening after I water the plants. I ran over my hose with the riding lawnmower, but I fixed it with a quick connect. In short, they can be reattached. I can't believe it, but seeing is believing!!!! When i turn my monitor onto its right side, it kind of looks like that music symbol that starts the song. Oh yeah...the Treble Clef (been a long time since high school band). That looks like frustration, my friend. Good luck with that. michelle - Not really doing the "things" thing, but just thought I'd play Wordless Wed since I had a photo that kinda said it all. ed - The odd thing is, my kids had nothing to do with it. I just want to know... how is this even possible? idaho dad - Sounds like a pretty good plan to me. sara bonds - Hey, thanks for stopping by! I had no idea you had a whole WW thing going on there. I "registered" this story too. Thanks! kathy - I don't think anyone would touch this thing with a 10 foot hose. mom thumb - Water plants? What's that. anon - That's what John Bobbitt said. mom - Oh, you must believe. jocelyn - You're right about that. Maybe I'll write a song about it. Oh wait, Dylan already stole my idea, Tangled Up In Black. 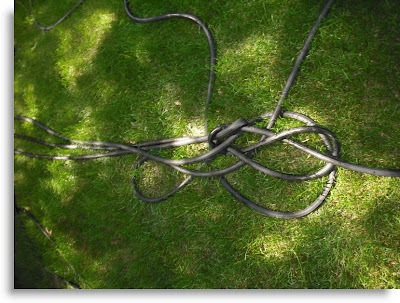 heather - I had to literally unscrew the 2 pieces of the hose and untangle it like a fat extension cord. Like I said, I have no idea how it was even possible for it to get tangled up like that, especially since the one end has been connected to the house the whole time. Weird. The Flying Spaghetti Monster has landed! All gaze in adoration upon his noodly appendages!! "An even longer long, long time ago in a backyard even farther far, far away...."
gette - You may be right. It seems to me it took some kind of intelligent design for my hose to end up that way. drahdrah - Thanks, I'll need it. VE - I'd agree with you, but unfortunately my hose has very little force. My garden hose. I think it looks like modern art... you could make a million ya know.